Another week, another film about Rioja*. Super-Man can however rest at ease: this one though is unlikely to be a box office smash, burdened as it is with the unpromising title Regum Mensis Arisque Deorum. It’s latin, I’m told, for “For The Tables Of Kings And The Altars Of Gods”, and if it rings a faint wine-related bell it’s probably because you’ve been paying too much attention to bottles of Chateau d’Issan (the Bordeaux third-growth for whom it is a motto). The film, or an edit of it, was recently premiered at the Spanish embassy in London, and I was lucky enough to be invited (lucky because there was more to the evening than simply watching a promotional video with an ambassador – there was actual wine afterwards, of which more shortly). 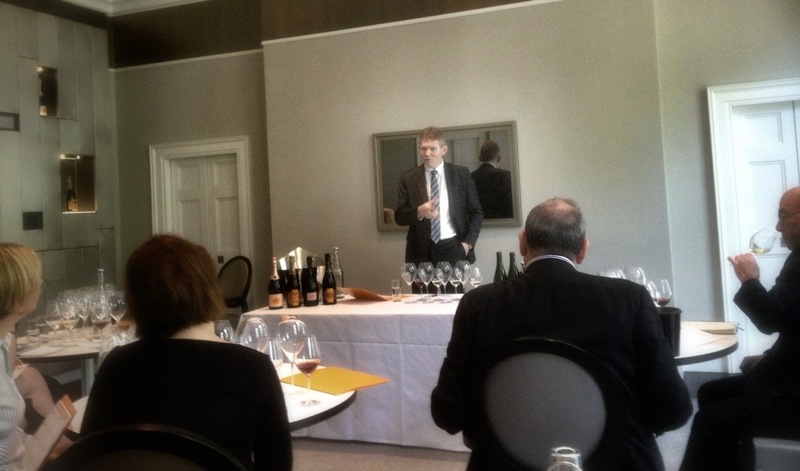 As it happens, I went to another terrific tasting the following morning, the second being devoted to Veuve Clicquot’s various rosé Champagnes, and it was the contrast in the two presentations that most struck me (though the wines were also rather striking, so I’ll come on to them). The way these two historic wine-growing regions, Rioja and Champagne, choose to present themselves could hardly be more different. It started with the locations, one an old building full of oil paintings in gilded frames and enormous tables hewn from ancient oak, the other a modern architectural braindump hidden behind a historical facade, full of glass and bright colours and moulded plastic and little wall-embedded TV screens. The presentations themselves offered a similar contrast. The Rioja film was full of wizened old souls, not so much wrinkled as viciously corrugated, pruning gnarly old vines with cigarettes hanging out of their mouths and crushing grapes using rudimentary antique hand-powered contraptions that look like leftovers from the Spanish Inquisition, when they would have been used to gently crush something else entirely. If you know nothing about Rioja beyond its self-produced publicity, you’d think all that happened there is the practice of centuries-old winemaking techniques by even older winemakers using older still equipment, all of it counterintuitively taking place in brand new buildings designed by Frank Gehry. Then there’s Champagne. Here, the impression is of the total absence of effort. Like everyone they send over to London Veuve’s chef de cave, Dominique Demarville (that’s him above), was impeccably presented in an immaculately-tailored suit. Rioja’s representatives need a translator to communicate in English; Champagne’s are born bilingual. Their hair, their clothes, their smiles and their handshakes all ooze class. Even their names do the job: I met the charming UK brand manager of Moët Hennessy, whose name is Arthur de Lencquesaing, a surname of such inherent poshness that you feel it should have its own Wikipedia page, just to be sure that all the world can find out about the history of Arthur’s forebears back to the 16th century. It is unsurprising, then, to discover that the surname has its own Wikipedia page so all the world can find out about the history of Arthur’s forebears back to the 16th century. If you knew nothing about Champagne beyond its self-produced publicity, you’d think that over there nobody ever sweats, most of them produce gently carbonated urine, and that every September or so millions of grapes gently pluck themselves from their vines and roll in an orderly line to the nearest winery, where they politely make themselves into fabulous fizz. I’m not sure that either path is a particularly good one. 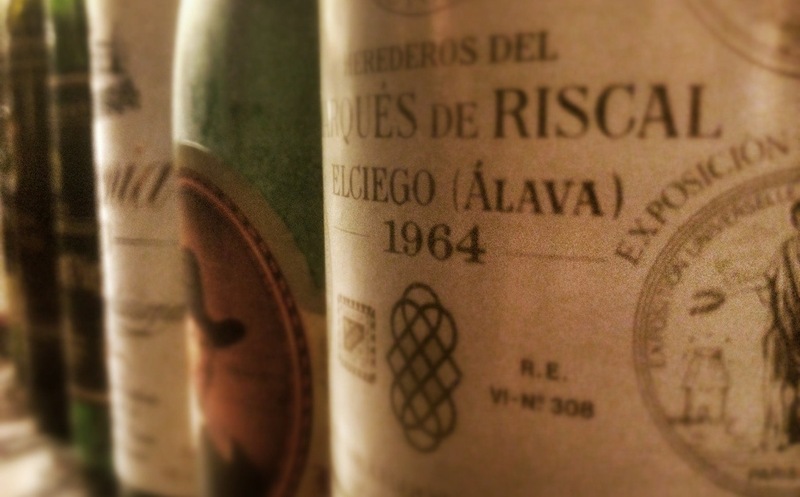 Rioja would benefit from fostering a reputation for more than just architectural innovation (and has the wines and the people to do it), but its strategists seem traditionalists to the core. Meanwhile it’s hard to see the recent demand for grower Champagnes, wines made in small volume by real people, as anything but a backlash against the massive houses and their air of perfumed arrogance, even if there’s not yet much evidence of it on the shelves of Tesco. After the Rioja film, we were invited to settle around a table of extraordinary immensity to try eight gran reservas, starting with a 2005 CVNE Vina Real – young, modern but really very good – and heading back in time until we screeched to a halt with a 1964 Marques de Riscal, a stupendous and surprisingly youthful wine rapidly approaching its 50th birthday. Notable stop-offs along the way included a pair of 1994s, one excellent (Castillo Ygay), and one markedly less to my tastes (Marques de Caceres), and a fine example of the corner-shop staple Campo Viejo, from 1981, still going strongish (though it had aged faster than its peers, and I doubt it’ll see its half-century in much style). 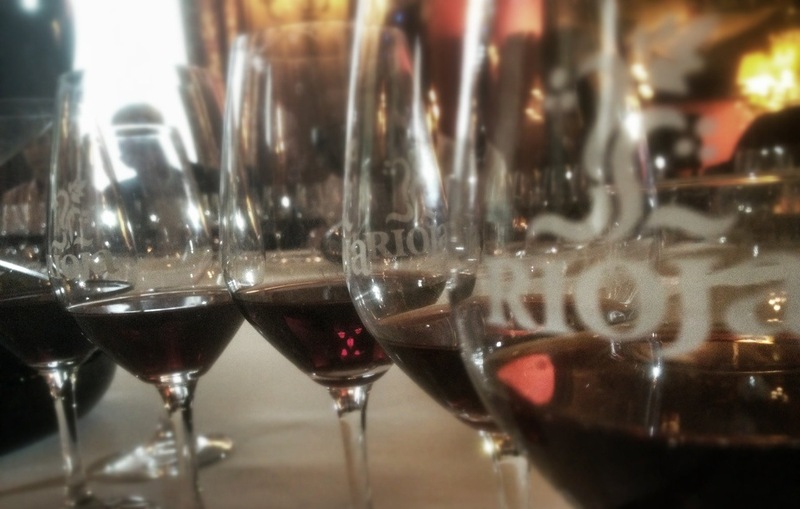 Rioja continues to produce excellent wine at excellent prices – the Vina Real costs around £20, while the latest version of the Marques de Riscal costs between £28 and £38 pounds, which given that it’s already eight years old and is proven to have the capacity to live for another 40 and more, is not entirely unreasonable. Though you might have to actually go to Spain in order to find one, many gran reservas from, say, the excellent 1970 vintage can still be found for less than £100, which in the scheme of things is pretty good. And so to the Champagne, where there was also evidence of relative value. Relative, that is, to exceptionally poor value. The basic range of Veuve roses consists of non-vintage, vintage, and La Grande Dame. The first costs around £40 and is a good wine of its type – “a beautiful success”, said Demarville, though I think he was talking commercially; the second in the region of £50-£55 and is extremely good – the latest release, 2004, is “one of the best vintage rosés we’ve ever made” and given the slender mark-up from the basic version is certainly the “value” option in the range; and the third will set you back about £250. It’s a more refined beverage than its cheaper cousins, sure, but at present even if they cost the same I’d take the vintage over the big woman, in which Demarville detects more quinine (the slightly astringent flavour used to flavour tonic water) and I detect the flavour of humdrum Jewish Passover staple matzah. “This wine will be amazing in three or four years,” said Demarville, which is all well and good but the vintage is amazing already and if you buy that instead of the large lady you’ll save a not inconsiderable sum of money – enough for a couple of 1970 gran reservas, in fact. There’s also the recently-launched “cave privee” series, which seems to be a way of getting shot of all the old stuff they’ve got lying around the basement. The current release here is the 1989 rosé, with future installments to include a 1990 rosé, a 1990 white, a 1982 white and a 1979 rosé. Demarville describes this as “a wine for connoisseurs, collectors and champagne lovers”, and is entirely right to do so – it’s a different beast entirely to less aged versions, copper-coloured rather than pink and with gentle, geriatric bubbles rather than the forceful fizz of youth. It’s a fascinating drink, and for all its age half the price of the Grande Dame, but is for those who take a particularly cerebral approach to their bubbles. *I’m referring back to my last post, which you can find here.